Acceptable file types: .jpg, .tiff, .pdf, .eps and .ai files. Please make sure your artwork size is the same exact size of your order. Also, do not include any bleed or crop marks but do allow 0.125″ for trimming zone around your artwork. Should I include fonts or images with my files? No. Instead, please ensure that all fonts are converted to outlines and all images are embedded prior to submitting your art. Photoshop users, please provide flattened files only. What is the difference between raster and vector artwork? Raster-based artwork such as photos or flattened artwork (from Adobe Photoshop) are made up of tiny squares (pixels), and depending on your resolution and/or final output size desired, the file could have a low quality end result. Any raster elements you wish to use should have a high enough resolution (DPI) before considering them for your large format product. Vector-based artwork such as illustrations or clip-art style elements (from Adobe Illustrator) is made with mathematical calculations, and can be scaled up to any size without losing quality. Keep in mind that any effects used in Adobe Illustrator are raster-based and have transparency: this greatly adds to file size and you must have correct settings in your “Document Raster Effects Settings” to ensure best output for these effects. If you are doing a photo-quality print on a 36″ x 48″ poster, and leave the raster effects settings at default 72 DPI – you may see tiny squares in your drop shadows, as opposed to a smooth shadow. What color mode should I submit my files in? You should send us your files in CMYK mode since it’s the mode used for color printing. If you send us a RGB file, there’ll be a color shift when it’s converted to CMYK and the printed work is going to look different to the one you sent. 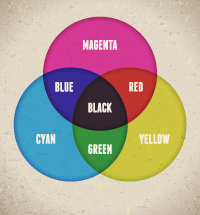 The reason this color shift occurs, is because the RGB color scheme has a greater range of colors than CMYK, allowing it to produce more vibrant colors. Printing colors produced in RGB mode will come out darker and duller than they seem on the monitor. However, because of the greater range of colors RGB mode has, files shown in CMYK mode will always show up accurately on screen. Do I need bleed or crop marks for my files? No bleed or crop — only trimming zone area. Make your artwork match the size requested on the order but do allow 0.125″ for trimming zone around your artwork. We are not responsible for crop marks or registration printed. My art files contain transparencies, will they print Ok? No, it is always best to flatten any file you send. We consider flattening transparency part of basic file setup and will not check for this issue. Therefore, if you send a file that is not flattened and there is an issue with the transparency after printing you will be responsible for the project and a re-order if you choose. Can you print borders? We utilize a plotter for cutting. During the process it is likely that the sheet will shift so any border designed too close to the cutting line will look uneven in the printed product. Therefore, we highly recommend that you don’t design with borders. If you do, make sure they are at least 1/4″ inside the trim zone. Even in doing this, we still can’t assure the borders will be even and will not be liable for reprinting. Thin borders may look uneven. The thicker the border, the better it will look. What is resolution and why does it affect my order? In short, resolutions directly relates to the quality of your print. To ensure clear, high-quality prints a resolution of 300dpi is needed. If you are taking your images from the web, those images are typically defaulted to 72dpi, almost guarantying a blurry print. How far away can my print be seen? Before designing or asking us to design, you’ll need to know the distance between your sign and the audience you’d like them to notice or read the message. This distance will vary greatly depending on the placement and purpose of the message. For example, if you want people to be able to read your signage from a road that is 300´ away, your letters to be printed at 30˝ tall to get the maximum impact from your signage. 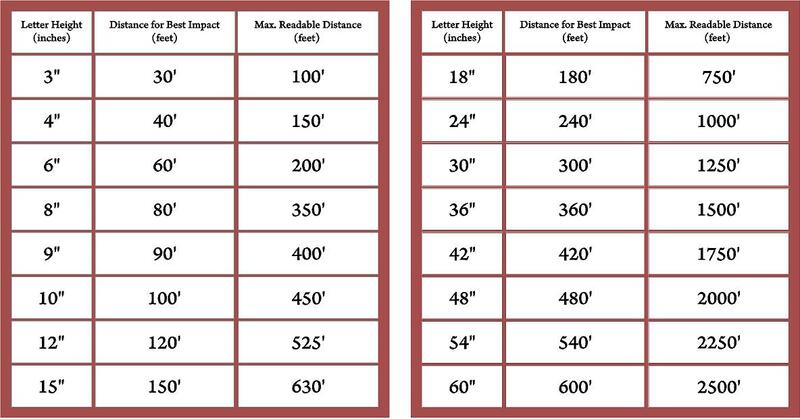 Refer to the size chart to help determine your letter height. Maximum readability = your audience will barely be able to read. If you’re wanting the message to get across, stick to the maximum impact column. You might also be interested in the research that has been done regarding the psychology of color in the marketing world. 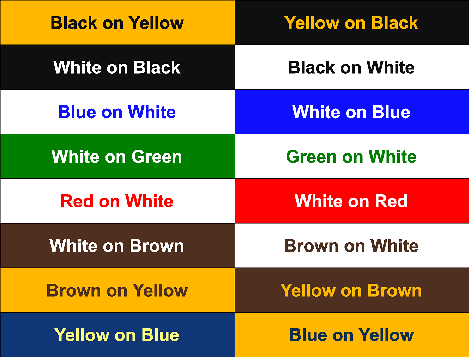 There are several resources, you can start here: CLICK FOR ARTICLE ON PSYCOLOGY OF COLOR. Can exact measurements be cut for all products? Because of the different materials used and the finishing of our products, there is no guarantee for exact measurements of your order. There can be a very small percentage that could be off because of this reason. We do our due diligence to make each product exact to the size requested, but there could be a small measurement that could be off because of the production finishing or material of your order. Do you do color match? We do not color match, however, we can assign Pantone colors as needed. These colors will be converted to their CMYK equivalent. This will not guarantee a 100% Pantone match. We can provide you with color match service which involves us doing several color tests to get a match but this will incur an additional fee. Do you print white? No. Do you use any spot colors or Pantone colors? We only print 4 color process (CMYK). If you use Spot or Pantone colors, please have them converted to process colors prior to file upload. We also offer stock colors for our vinyl graphic selection. © 2017 Kwik Signs, Inc.